Although needs vary, one factor remains constant: every senior citizen can benefit from proper advanced legal planning. Our Elder Law lawyers are here to educate and guide you through the issues that will impact your future. Elder law involves all aspects of planning for aging, illness and incapacity. Ideally these issues should be addressed in advance of a crisis. Please email us with any questions. Proper estate planning and asset distribution before death can help the whole family. If this is done properly, an elderly person can receive the full value of Medicaid and Medicare benefits, and can also preserve assets for an estate to benefit children and future generations. Children of parents who are under home care, or in nursing homes or other assisted living arrangements, should make sure their parents are receiving all the benefits to which they are entitled. Visit our Estate Planning page to learn more. Our desire is to help you accomplish all of your lifetime planning goals. Advance directives, living wills and health care proxies are just a few of the tools available to provide for a secure future. When needed, we can work with your financial representatives to coordinate a plan to secure your future and the future of your loved ones. Contact us with any questions. 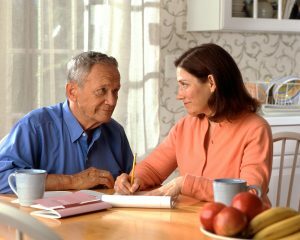 If you have the responsibility of performing the duties of Power of Attorney or acting as a Guardian for an elderly parent, relative or friend, you’ll want the comfort of knowing that all legal and financial matters are in order. The Elder Law attorneys of Rizzo & Diersen are available to advise you on your responsibilities and review and update as needed. Contact us to set up an appointment at any of our three convenient locations. The attorneys at Rizzo & Diersen will review these Elder Law areas with you and develop a personalized plan to meet your individual needs. Contact us for a confidential consultation.